Your runner Training and determination lead to personal victory! Thanks to all who donated to Arthritis Foundation! 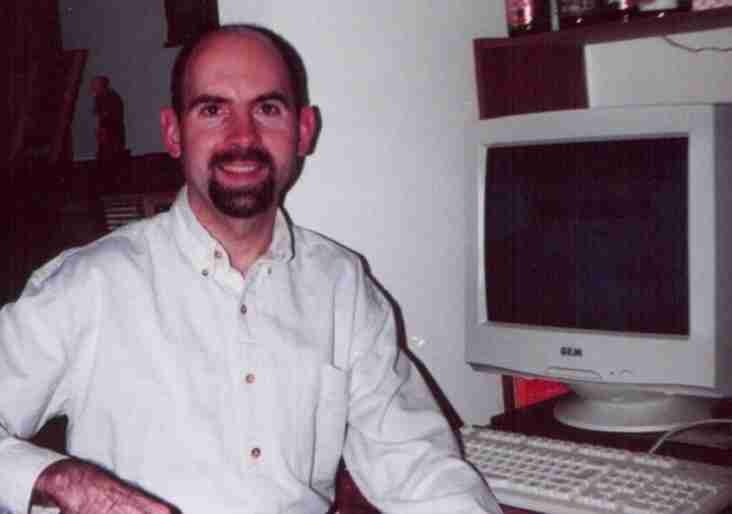 In 2002, I raised close to $4,000 for a very worthy cause. In return, they set me up on a training program and sent me to Ireland as part of their "Joints in Motion" team for the event. This page contains my weekly training log. Since I ran in honor of my father, it includes updates on his condition. Scroll down to "Jump To" sections on this page. Please invite your friends to visit my site! Click here for my 2003 running events! - Yes, I'm addicted. Wow! I guess I'm asking for alot. Could you pray for my Dad's recovery too? Once I saw the enticing article, I cut it out and considered the idea for a few days. I called and was invited to an information session the following week. It was held close to my house and the other 2 attendees were attractive ladies, so I knew I was on the right track! Sue, the Arthritis Foundation coordinator, presented the information and introduced us to Amy, the team coach. When I learned that the main training area would be the park just a block from my house, it grew apparent that fate hadn't brought me this far just for the ride! The Announcement - My parents live in New York state, about 4.5 hours from my house. They happenned to be passing through on their way to visit my sister in NC, so they stayed over for the night on May 20th. I informed them of my plans after we took a pleasant walk. They were excited, which put me at ease with my decision. Dad's shoulder operation was successful and he goes for therapy three times each week. Unfortunately, two weeks ago he suffered a setback when he "overdid it" a little while helping me plant some grape vines at their place. He applies heat during the day and ice before bed (for as long as he allows my mom to do it). His other shoulder will be operated on in a few months. Getting Ready - My actual training program starts on June 8 with some lectures concerning shoe selection, hydration, cross-training and other serious runner stuff. From there, it's a 20 week program. This includes 2 (optional) group runs each week. I'm hoping to change my work schedule to make it more convenient. In May, I've averaged only about 11 miles per week, so I have my work cut out for me! Training - I don't want to embarrass myself, so I'm trying to increase my weekly miles to a respectible level. In the last week of May, I did 20 miles. That's progress, especially since it isn't a good idea to increase your mileage more than 10% per week. One day I ran with a manager I work for. It turns out that he's participated in 5 marathons, so I was a little intimidated at first. We had a good run! My physical state - I've been experiencing some aches and pains. No surprise there! I just hope I haven't injured myself. Got to do more stretching. I even scheduled an eye exam, since I'm contemplating Contact Lenses or even Lasik so I can see the scenery around me as I run. Probably go with contacts for now. Training - Our first group practice was on Wednesday evening, 6/12. About a third of us were there at 6pm, after rain and thunder darkenned the afternoon. I did 45 minutes at an easy pace (about 5 miles). After stretching, I barely had time to chow down at a choir BBQ before heading to work for my 10pm shift! My left leg is still bothering me, but I ran the next day as well and it didn't feel any worse. New Shoes - Never had I spent over $15 on a pair of sneakers. This will prove my dedication and resolve to you for this endeavor: On Thursday morning (after work) I bought a pair of running shoes for $94.00! New Balance M1121MC -if you're scoring at home. They made their debut on a 4 mile run Saturday evening. Dad's Condition - He visited the doctor last week and was given a new set of exercises. These can be done at home. The pain from his "setback" is slowly going away. $$$ - 12 people have contributed thusfar. That includes 2 members of my current choir and one from a previous choir. But even if you can't carry a tune, I hope you can give! Training - Approaching T-storms shortened our Wednesday evening run, and I still can't fit in the Saturday training, so I've been on my own. Starting to keep track of my pace. It's around 7.5 minutes/mile so don't look for me to shatter any records in Dublin! I spent 3 days at my parents' place and my brother Ken did a 4 mile run with me on Lackawack Hill. We didn't walk, even in the steep areas! My physical state - No new aches, pains or blisters. Training - Man, has it been hot!!! Last Wednesday, our practice was cancelled due to the high heat index. This Wednesday the index will be even worse at over 100, so we'll run the next morning (4th of July) instead. I plan to invite my teammates over my house for some cold Gatorade when we're done! Running is going well. Between Monday and Tuesday, I did 12 miles. My physical state - The best thing about new ailments is that they help you forget about old ones. Please pass the ice pack! 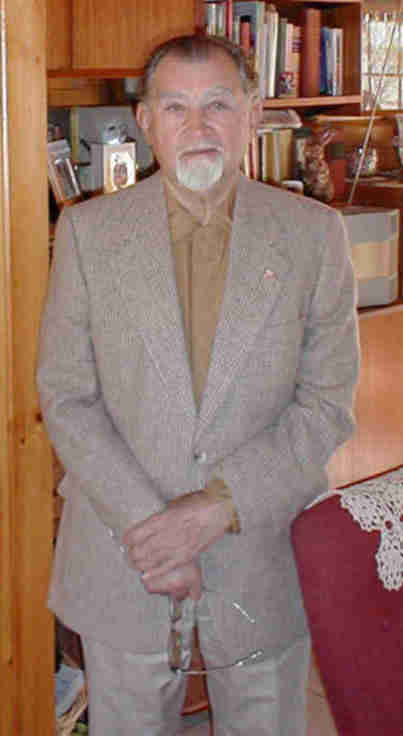 Dad's Condition - He's faithfully doing his therapeutic exercises at home and is in good spirits. We're trying to keep him from going overboard again. Training - A great week. I set a new distance record of 9 miles on 7/6! 28 miles total for the week also made me happy. My physical state - Got Contact Lenses for the first time. Now I can see where I'm going, which should greatly reduce the risk of running into trees, cars and other runners. And I can finally appreciate the scenery. Fundraising $$$ - We're up to 28 contributors. I made up some pocket cards listing this site and donation info that I can pass out to friends when they make the mistake of asking me what I've been up to! Training - Total miles for the week was 34. Alright!! That included a long run of 11 miles through northern Wilmington with my QVC running partner. The night before, we were both at a "Distribution Fiesta" for management. Due to the free drinks, it wasn't too easy getting up the Sunday morning before that mammoth run. Good thing we did it in the late afternoon. I ran in my $10 K-Mart shoes and my feet felt just as comfortable as with the super-duper high priced pair. My calves felt slightly different about the whole thing. They grew pretty tight over the last 3 miles and took the entire next day to recover. The price you pay for getting tough! My physical state - My calves better get used to abuse, that's all I have to say! Is it in you? Dad's Condition - He's in good spirits and doing the home exercises. No word yet on when his other shoulder will be operated on. His morning always starts off with the long walk up the driveway to check the mail. In the afternoons, when it's warm, my parents take a swim in the back pond. Training - Lackluster week, but hey, it happens! Not seeing much of my team. Still managed to do 28 miles total and this time did 11 miles solo at my park. My physical state - Sometimes, my feet just get rubbed the wrong way. Different places every time now. No lasting effects. You can never stretch too much before and after a good run. The calves tightenned up again during the long run, but this time they were fine by the next day. Training - Back up to another 34 mile week, which culminated in a 1 hour 45 minute run (about 12 miles) on a very humid Sunday Morning. I ran with my partner in the area around the building I used to work in for Matlack. Luckily, I hadn't had too much to drink at the Matlack party the night before. It was kind of our one-year anniversary of going out of business and my overeating worked out to be good fuel for the run! My physical state - My calves are starting to get used to this torture. However, my left foot has some swelling in the area next to my big toe where the bone protrudes slightly. .....OK, maybe you don't want to hear about these kinds of details, but what do you expect me to write about here, my comical love life? Dad's Condition - His progress has been good enough that they've scheduled his other shoulder to be operated on: September 19th. It's nice to have a specific date to look forward to and I think it helps him stay focussed on his recovery from the first operation. $$$ - We've reached the halfway point of $2000! Hooray!!! Now comes the tough half. Help me out by telling your next-door neighbors what I'm up to. Thanks, you're wonderful! Over 75 people attended the Saturday party, with many staying one or two nights. We kept a bonfire going well into the night. The party was a huge success. There were 3 tents near the fire for campers. Some stayed in the barn. The house was filled up from top to bottom. And there was even a port-a-potty, something that seriour runners can always appreciate! My physical state - Not bad, except for the bunion on my left foot! Training - Good week. Feeling strong! The evening I returned home from vacation was hot and humid, but I did a long run under the lights at the park and survived 12 miles. At Wednesday evening team practice, I did a "tempo" run of 3 miles in 23 minutes, with my coach running with me part of the way. The week culminated on a high note on Sunday morning (8/11). I ran over 14 miles without my calves getting severely tight. For the rest of the day, I hobbled around happily, including a stroll around South Street in Philly after being stood up on a lunch date!! Dad's Condition - Hanging in there. His old navy buddy is visiting for a week, so they've been getting in some swimming and walking. Excellent! $$$ - I've got to get another push for funds going. Kind of put it on the back burner for a while. Any ideas? Training - Will this brutal summer heat never end? Hopefully I'll feel that much stronger once we head towards fall. Tuesday 8/13 saw me do 3 laps (9 miles) around the hilly horse farm known as Carousel Park. Wednesday practice was cancelled once again due to the heat. Did Ray heed that advice? Of course not. The weekend long run had to be postponed until Monday 8/19, due to working Saturday night for the big "Klondike Gold Rush" at QVC. I toughed out the last couple laps to complete 15 miles. That was 2 hours and 22 minutes of running. My physical state - After that long run, I visited the doctor to discuss the periodic discomfort in my left leg. For now, we'll go with more hydration, Advil, and more warm-up before each run. I'm actually down to 128 pounds--I can see the Kenyans sweating already! Motivation - There wasn't much on TV on Sunday night, but the title of a certain movie caught my eye... It was a no-brainer for me to watch "Marathon Man" (1973, Dustin Hoffman). I hadn't even seen it before. The next night, I stretched the analogy a little with "From Here to Eternity". 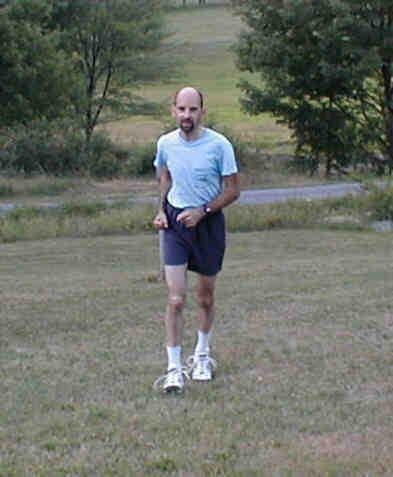 Training - My "tempo run" at Wednesday evening practice was 4 miles in 31.5 minutes. Since I was going for an 8 minute pace, that was satisfying. Even more satisfying was to close the week with a long run of 17 miles in 2 hrs. 35 mins. I can't even think of a witty remark worthy of that. But I was happy! My physical state - Paul Bunion hasn't been causing problems. He's got a little cousin on the second toe of my right foot-- Buddy Blister. He's right at the tip of the toe, but like Paul, isn't causing difficulties. Extra stretching has been paying off. My legs have not been getting as tight as they had been. Fundraising $$$ - Unfortunately, not much to say. I don't know, ask your brother or sister to give. Our total now stands at $2600 with $1400 to go. Sporting the official team shirt! Training - On Tuesday, did 3 laps (9 miles) at Carousel--the county horse park. Wednesday was a new experience... I ran 7 miles in the rain, including a 5 mile tempo run in 39 min. 30 sec., which was good, since I was going for an 8 minute mile pace. Good weather for the rest of the week until the Sunday morning long run. It was raining and under 70 degrees while I struggled through 2 hours 45 minutes. Just my 2nd time wearing a hat! I was a very soggy runner! My physical state - My whole body held up pretty well. Training - I'm pumped for next week's Philadelphia Distance Run! It will be broadcast on local TV the following week. I bought some Adidas trail running shoes for $50. Also purchased some better socks and a good pair of running shorts. Finally got a passport photo and submitted the application. Visited my brother in Queens..... and oh, yes, got some running in as well. Now averaging about 38 miles/week. Long run has leveled off at 18 miles, so I'll try to add to that the week after this Sunday's half-marathon. My physical state - My right leg has developed some nasty pain from time to time, but has only slightly hindered running. This is no time for an injury. Taking Advil and will be careful. Dad's Condition - Doing well and trying to accomplish some jobs at home before he has his other shoulder operated on Sept. 19, since that will put him out of commission again for a while. $$$ - We're just short of the $3,000 mark. It's getting harder for me to keep asking people to give, but everything's going to be OK. Know anyone who's Irish? Know anyone who's got arthritis? Know anyone who should run? Week 14 of Training - Special Philly Distance Run Edition! Training - Some night running on Monday due to arriving home from Queens at 9pm. The 1.75 mile path through my park is lighted, but after completing my first lap, I found out what time the lights go out!!! So I proceeded to hit the road and jog through a nearby development to get in a 45 minute workout. Tuesday was a regular day run and Wednesday's group practice included some more [mile] intervals. By Thursday, my leg was hurting again, so I took off and made Friday my final run before Sunday's race. By then I had grown quite concerned about this possibly being a season ending injury! My physical state - A couple times while in bed, the slight pain in my leg made sleep difficult. It seems to be a result of lots of running, so I will try not to aggravate it. I'll have to make all my miles cound and even take off additional days. But Advil is a huge help. Fundraising $$$ - Not much to say. I will soon send out ultimatums to those who haven't come on board. Remember that tax deduction! It's getting closer to next April 15th every day. Philadelphia Distance Run - What an exciting and fun experience! Training - I was nervous about this week's long run because of the leg pain and stiffness since the half-marathon, but was relieved to do a record 19 miles on Saturday evening. 3 hours and 3 minutes of running, with just a 1/4 mile walk mixed in to allow me to eat a granola bar at mile 15. At that point, I think cardboard would have been tasty! The leg was unhappy for the first 3 miles, but soon felt fine. So now it seems that I can run, but not walk! Visited my brother in Queens again (so I could hit an awesome Billy Joel/Elton John concert at the Garden). I ran around my old neighborhood for an hour, again fighting the tightness. Please don't tell my doctor. My physical state - No, the right leg hasn't really improved. I'm just dealing with it. Like I said, this is no time for an injury. Dad's Condition - His recovery is on track since the Sept. 19 surgery. Doctor says his range of motion is already 75% of what it was before the operation, which is ahead of schedule. I'll visit this coming weekend to make sure he's not using it too much yet. $$$ - With just a month yet, this is the final push. I'm still almost $1000 short, so I'm getting more aggressive (but in a nice way, of course). Last minute suggestions? Training - I put in my usual 35 miles for the week, including an hour of running through my old neighborhood in Queens. The Saturday evening "long run" was another day/night affair. It started around 6pm, with the sun still shining and ended after 8pm when it was pretty dark. That change makes it seem like you've been out there even longer than the 2.5 hours it took. Not to mention that once it's dark, the park empties out quickly, including the attractive ladies that keep my mind occupied as the miles go by. My physical state - Again, the leg has neither improved nor gotten worse. I can run, but can't always walk. Haven't been taking Advil regularly, so I can always be aware of old and new aches and pains. Training - My long run went for 21 miles this week!!! Glory be, the funk's on me! Earlier in the week, I had a few other good days of training. One was some hill running for an hour up in the Catskills again. The next evening, I did 4 one mile repeats at Delcastle Park. Average time was 7:40 and the important thing is that the times were all pretty consistent in humid 84 degree weather. My physical state - Nursing my legs along. No new injuries to report. Dad's Condition - His recovery continues on track since the Sept. 19 surgery and even my mother admits he's being careful not to aggravate this shoulder like the last one. 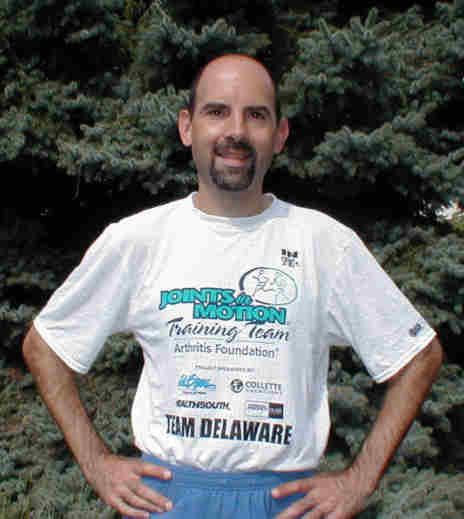 Training - Last minute decision to run the Delaware Distance Classic 15K! Click for photos, stats, commentary. My physical state - No news with "the leg". I'm just continuing to stretch, hydrate, and take Advil only when necessary. It hurts the most after standing or walking around the Pack Floor at QVC for 10 hours! Training - Twenty weeks of training is almost over. It's time for my "Super Bowl". I'm pumped! As in any marathon training program, I've been "taperring down" my running over the past couple weeks. This week's long run was a mere 9 miles. It's now dark when I do my weekday runs and Thursday's in particular was cold and rainy. You might even call it miserable weather, but I enjoyed the experience of running in different conditions. Marathons don't get postponed due to rain! Wednesday night was Team Delaware's Send Off dinner. Mmmmmm! Good food and of course, some final inspiration from our coordinator, coach and former Joints in Motion participants. My physical state - Still getting used to different little pains here and there. But there's just no time to worry about them. Just take Advil and pray that they go away. Week 20 of Training: Just Do It! Travel Time - Team Delaware meets at noon on Wednesday 10/23/02 to pile into a van headed for JFK airport in New York. I'll be joined by Sue (our coordinator), Duncan (assistant coach), and 5 other participants (a couple runners and 3 walkers). We'll have the pleasure of taking a red-eye flight on Aer Lingus direct to Dublin. Departure at 7pm and arrival at 6:30am. I'll write about the whole trip, so check back for all that's fit to print! My physical state - Walking on air! Ran at Carousel Park for the first time in a month, finally checking out my new Adidas trail shoes. Sweet! My legs functioned fine. Perfect conditions. Fundraising $$$ - Please give whatever you can afford. I'm still $700 short of my $4000 goal and must have it all in by the end of November. Since it's tax deductible, you'll be getting some of it back soon enough. Team Delaware departs - My roommate Mark dropped me off in the parking lot of a Happy Harry's drugstore to assemble with my Joints in Motion teammates. Six "athletes" were joined by our coordinator Sue, assistant coach Duncan and a couple family members. We piled into a mini-bus after receiving goodies and best wishes from head coach Amy. The long trip started off right with a champagne toast. Sightseeing - Dublin is a fun city and we had just enough time to enjoy ourselves while taking care not to have too many Guinness drafts. The Marathon - The Lord blessed us with great weather for the race. All previous days (and even departure day) included at least some rain along with a chilly wind. But "Bank Holiday" Monday was cool (mid 40's?) and overcast all day. We lined up for the 9am start excited and just a bit nervous. Click here for the full story and photos. More will be on their soon. Running gear and links - Shop for shoes, athletic apparel, posters. Links to running sites. Tips from Runner's World - Training advice, race strategy, shoe reviews, injury prevention: Subscribe here! 2003 running events! - Yes, I'm addicted - 2003 half-marathons, Broad Street Run. Icicle Run 2004 - 10 mile race in Wilmington, DE in January. Brrr!